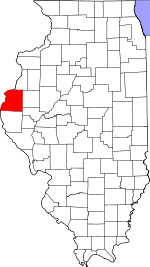 Rock Creek Township is one of twenty-five townships in Hancock County, Illinois, United States. As of the 2010 census, its population was 350 and it contained 169 housing units. It was formed from Sonora and Pilot Grove townships on April 27, 1855. According to the 2010 census, the township has a total area of 35.97 square miles (93.2 km2), all land. The township contains Rock Creek Cemetery. Many of the old gravestones are no longer legible. A large stone designating Rock Creek Cemetery has the names of descendants on its back. "Rock Creek Township". Geographic Names Information System. United States Geological Survey. Retrieved 2009-09-20. This page was last edited on 23 February 2019, at 19:05 (UTC).